This book about J.C. Leyendecker is written by Laurence S. Cutler and Judy Goffmann Cutler & the National Museum of American Illustration. The book is 256 pages and published by Abrams. Leyendecker was the first illustrator that invented branding in advertisements. His most striking advertisements he did for The Arrow Collar Man, a fashion brand for men. He also made illustrations for Kellog’s Corn Flakes and Ivory soap. Joseph Christian Leyendecker was born in Germany on March in 1874. In 1882 the family immigrated to Chicago Leyendecker studied art at the Chicago Art Institute and he also studies art in Paris together with his brother Frank. In 1899 he got his first commission for The Saturday Evening Post. It was the beginning of a long collaboration with the most popular magazine in the country. In forty four years he produced 322 covers for the magazine. It was the Golden Age of American Illustration. Almost all of the covers were painted and all of the articles and advertisements inside the magazines as well. There were many great illustrators like N.C. Wyeth and of course Norman Rockwell. Norman Rockwell is more known than Leyendecker, but Rockwell was a big fan of his work. Leyendecker painted everything from real life and did not use photo reference. Rockwell used a lot of photos to make his paintings. The story goes that when Leyendecker visited the studio of Rockwell and he saw all the photo material, he took a look at it and after he left they never spoke again. 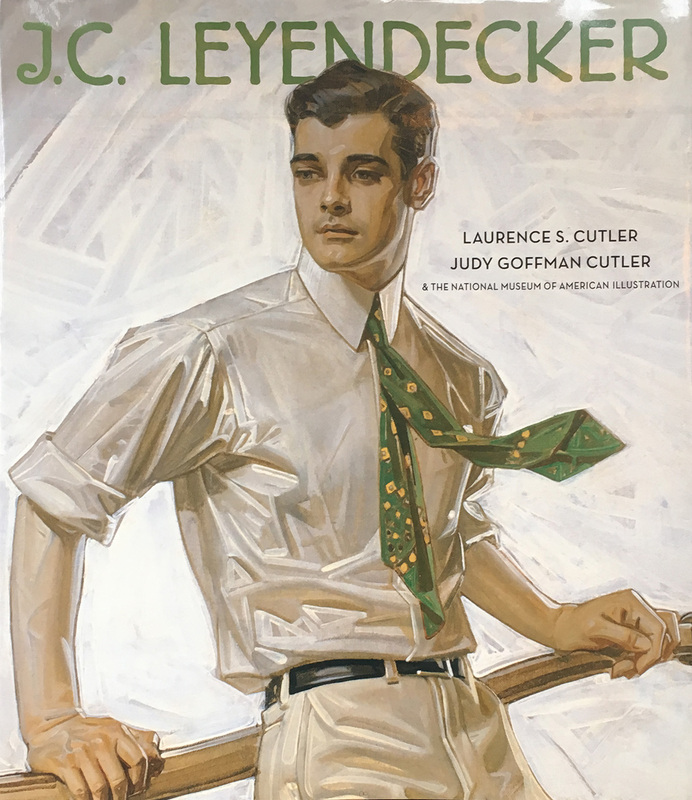 Leyendecker used models. One of the models that appeared on a lot of covers was Charles Beach. A very handsome man that became the first American Cultural hero. Charles Beach became Leyendeckers partner and the lived together for over forty years. This book is a great mix between a biography and a showcase of all the incredible art he produced. As an artist it is great to see the studies of his paintings. It gives some insight how his paintings were created. He did a lot of studies of materials and poses. The studies almost look like finished paintings. But they are a sort of practice for the final piece. The studies he painted on smaller pieces of canvas and when you look closely you see that he drew a grid on top of it. That helped him to transfer it on a bigger scale for his final painting. The images look very realistic, but when but they were actually heavily designed. For The Saturday Evening Post he created his most memorable covers that returned every year. Like the New Years baby’s and the covers he did for Thanksgiving. He also made a lot of covers for Collier’s, a magazine that produced fiction. Many famous writers contributed to the magazine, like Jack London. But the Sunday Evening Post was his main income. In the roaring twenties Leyendecker gave a lot of parties. The parties they hosted at their New Rochelle home/studio were important social and celebrity making events. The story goes that F. Scott Fitzgerald, the author of The Great Gatsby, modeled his main character after Leyendecker. In the twenties Leyendecker did most of his work. He was highly appraised and everyone wanted his work. But in the thirties the interest declined. Leyendecker was a very shy man and his partner took care of all the business. In his later days he would only talk to his sister and did want to see anyone else. As the demand for his work declined they had to let go of their exuberant life style. They had to fire all the servants that worked at the house. When he died in 1951 the house had to be sold and his paintings were sold in a thrift sale. This book captures the illusive style of J.C. Leyendecker and gives you a great inside in his work methods and also his personal life. For every designer, illustrator or painter this book is a must have. I can spend hours just watching and studying his art in utter admiration. It is quite intimidating to see the pure craftsmanship, but also a true inspiration. The book is still available on Amazon. Click on the links down below.